TORONTO, CANADA – October 10, 2017 – The Stars Group Inc. today announced the launch of PokerStars Power Up, an innovative new variant of online poker that combines the competitiveness and strategy of traditional poker with the thrills and excitement of modern video games. PokerStars Power Up features specially designed graphics that bring the game to life through immersive visual and audio effects and multiple avatars with rich personas and backstories. 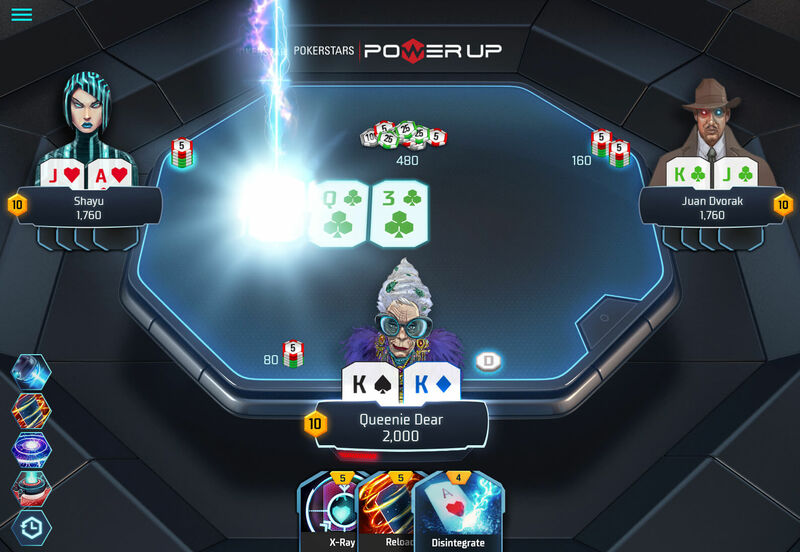 PokerStars Power Up is the latest innovation from The Stars Group and was created by its in-house game development team in collaboration with skilled poker and professional eSports players. The game delivers an engaging user experience within a futuristic, immersive competition that brings exciting twists and special powers to players within the context of a traditional poker tournament. PokerStars Power Up, which will roll out across PokerStars .NET, .EU, .COM and .UK sites throughout the week, is based on a No Limit Hold’em Poker Sit & Go format with three players facing off across an agreed upon buy-in stake of $1, $3, $7 or $15. While players start with the same amount of poker chips and are dealt two poker cards each hand as usual, they also start with two randomly selected powers. These powers - such as ‘Clone’, ‘Intel’, ‘Disintegrate’ and ‘Scanner’ – are reloaded throughout the game and can be used to rapidly change the flow of the match. Each power contributes to a visceral gaming experience by allowing players to, among other things, receive a copy of the last power played, peek at the deck, eliminate a card, and force an opponent to reveal a card. Adding yet another element of strategy to the game, each power uses ‘energy’. This means that players must strategically manage their energy levels so they can use their powers when it matters the most.